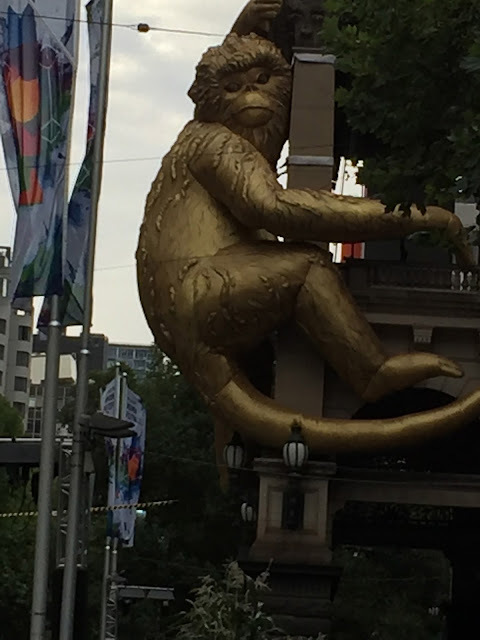 There was a giant, inflatable golden monkey clambering over the iconic Melbourne Town Hall for around a week in February, in conjunction with the White Night Melbourne that ran (insanely) from 7 pm to 7 am the next day on 20-21 February 2016. Throngs of awestruck people could not stop gaping at the King Kong-like figure, illuminated under the dazzling spotlight at night. The sight of a gigantic 7-metre high golden monkey hugging the wall of a 19th century monumental building during the year of Monkey was just so surreal, and definitely a stunning view that would stay in the minds of many visitors for quite a while. The work was created by an acclaimed Melbourne artist Lisa Roet. Unfortunately, the golden monkey was just there to stay for a week, and had been removed from the wall of Town Hall. But I do hope Lisa Roet will continue her ongoing fascination with the endangered species and will bring us more surprises on her artistic projects.